You might remember that we shared a post in November announcing the start of a new project, funded by Power To Change, to help communities protect Assets of Community Value. 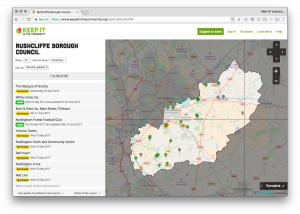 So we’re pleased to announce the (quiet) beta launch of our latest little site, Keep It In The Community, which we hope will become an England-wide register of Assets of Community Value (ACVs). The Localism Act 2011 was introduced with a great hope. Its provision for giving groups the right to bid on buildings or land that contribute to community life would allow the protection these assets, potentially taking them into direct community control should they come up for sale. Sadly, as currently implemented, the law hasn’t yet delivered on that promise. In Scotland, the legislation comes with an actual right to buy, but in England, that’s not the case, and with developers finding ways around the legislation more often than not, often the best the Act can bring about is the delay of an inevitable change of control. For the moment we’re not expecting the legislation to be given any more teeth. With Keep It In The Community we intend to at least help support a greater takeup of registration by local communities. 1. We’re gathering together existing asset listings from the 300+ English councils who hold them, to provide a single synchronised and complete record of all listed and nominated ACVs. 2. We’re providing a straightforward route for established community groups to nominate new ACVs in their community. 3. We’ll allow community members to provide more details, photographs, and useful anecdotes about each registered asset, beyond that required by the legal listing process. So far we have data from around 20 local authorities on the live service, with another 50 or so due to be added over the next few weeks. The remaining councils will be added over the summer. All the data is drawn directly from each local authority and as new assets are nominated or their status changes we’ll update their status on Keep It In The Community. Whilst we complete final testing we’re restricting the ability of community groups to nominate assets, but hope to fully switch that on shortly, once more of the existing assets are displayed on the site. The initial process for connecting each council listing is fairly low tech, relying on the scraping of a commonly formatted spreadsheet hosted on each council website. So for the moment. there will still be a fair amount of manual tweaking to keep things in sync. This is one of those important elements that will be fine to manage when the service is starting out, but may start to creak further down the line if it becomes well used – a classic ‘known known’ issue we’ll need to keep on top of. Over the summer we’ll be working with a representative set of community groups to extend the features of Keep It In The Community to improve how to submit assets for nomination, and how best to celebrate the listed assets by adding all sorts of local detail and background. Have a look and let us know what you think so far. In addition to the initial grant from Power To Change, this project has been implemented with the support of the Plunkett Foundation and the Ministry of Housing, Communities and Local Government.